I personally like him better in dirty white polo pants, but - no matter how dangerous and potentially foolish - it was pretty brave of Prince Harry to have the stones to put on his desert camo and fight. It's more than most of America's leaders' children can say for themselves (just ask Michael Moore). 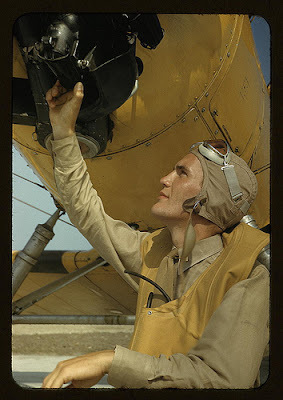 These photos of an older generation of fighters come from the incomparable Library of Congress collection. Browsing through is almost like facing a diner with a 20 page menu (so much of a good thing that it overwhelms). 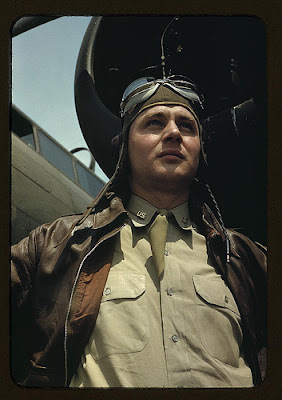 But how incredible to see these shots in color -- and not faded "vintagey" color, but bright P.L. DiCortia technicolor grandeur. 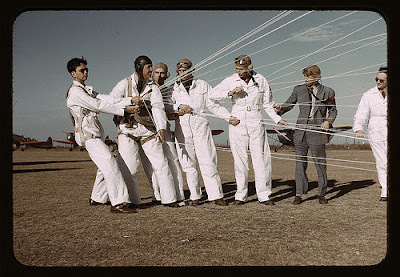 Editorial note (similar to my recent call out to the staff of Men's Vogue): If you happen to resemble the gent in photo #3, with or without the plane and the goggles, drop me a line and I'm yours. I like your blog. And yes, I think Mens Vogue is brilliant. Although, I am only a doctors office reader.